- In an open floor discussion, conversations, questionaning, reflections, insights; fragments of readings by participants welcomed. - Forbidden Zones by AYDIN MEHMET ALİ - reflections and conversations wih the author. - ALEV ADİL - reading, performing her poetry and other work. Both Alev and Aydın were born in Cyprus and have spent most of their lives in London. 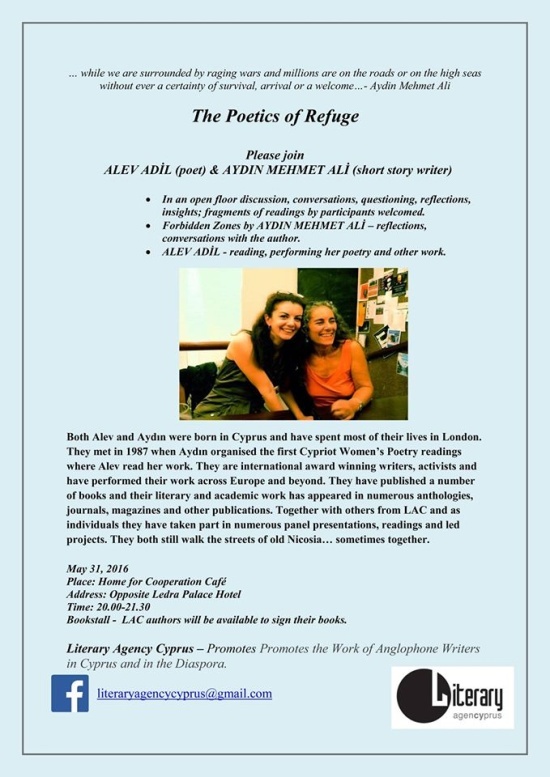 They met in 1987 when Aydın organised the first Cypriot Women’s Poetry readings where Alev read her work. They are international award winning writers, activists and have performed their work across Europe and beyond. They have published a number of books and their literary and academic work has appeared in numerous anthologies, journals, magazines and other publications. Together with others from LAC and as individuals they have taken part in numerous panel presentations, readings and led projects. They both still walk the streets of old Nicosia… sometimes together.